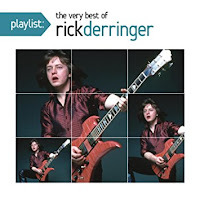 As a solo artist, the 1973 hit Rock and Roll Hoochie Koo is Rick Derringer's claim to fame. Of course there's much more to him than that. He was born Ricky Dean Zehringer Aug. 5, 1947 in Fort Recovery, OH which is in the western part of Ohio. He led the local band Rick and the Raiders when he recorded a vocal over an existing backing track. That song was Hang On Sloopy and it topped the charts in 1965. The Strangeloves had planned to record Hang On Sloopy but they got sidetracked. So Bang Records owner Bert Berns brought in 16 year old Derringer to record the vocal. Since the name The Raiders was already being used, Berns changed the name to The McCoys. After The McCoys ended, Derringer joined Johnny Winter's band and wrote Rock and Roll Hoochie Koo. It appeared on Winter's 1970 album Johnny Winter And. Then Derringer joined Edgar Winter's band and he played lead guitar on all of Winter's hits. When Johnny Winter started Blue Sky Records, Derringer was given a solo contract. His debut album All American Boy was released in 1973. The band on the album was Edgar Winter's band with special guests Joe Walsh, Suzi Quatro and Toots Thielemans. Rock and Roll Hoochie Koo reached #23 on the Billboard Hot 100. But the song has become a staple of classic rock radio. It's a very durable record. Derringer never had another big hit but he continues to record and tour today. He also got into production most notably with Weird Al Yankovic and the WWF's Piledriver albums of the 80s. He got that gig through Cyndi Lauper and her manager David Wolff. Derringer wrote, produced and sang Hulk Hogan's Real American theme. Derringer last recorded in 2009. But he is currently on his Golden Anniversary tour. This budget comp has Rock and Roll Hoochie Koo and Hang On Sloopy. Here's Rick Derringer with The Edgar Winter Band performing Rock and Roll Hoochie Koo in Los Angeles Nov. 1973. Heard that song on the radio for years. It is very durable. I still hear on the FM Rock stations around here in Chicagoland. He scored a long lasting bullseye with that tune. Good for him that he is still active and singing and touring.